The dart frog is a tiny creature, slightly more than an inch long. 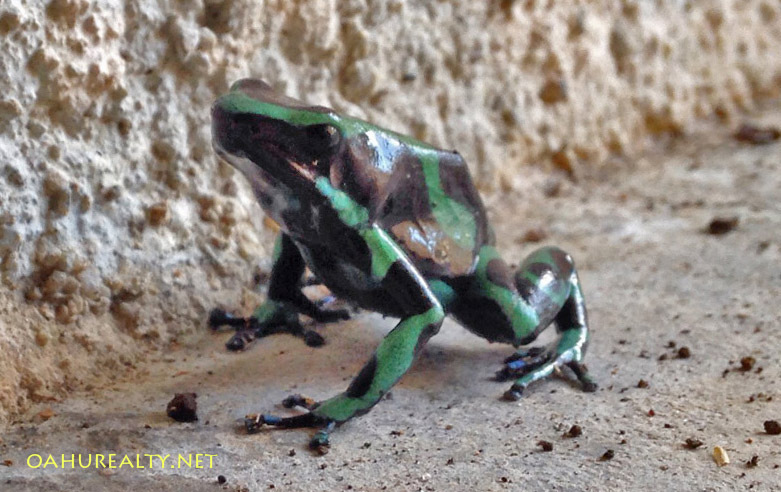 After a heavy rain, the dart frogs emerge and roam the sidewalks. They are agile and have good eyesight. Try getting close to a dart frog and they can dash (actually hop) away pretty quickly, making it difficult to take a picture. Here's the my first closeup picture of a dart frog. I followed it around and cornered it in my neighbor's carport. And here's a picture I took more recently of a dart frog in my back yard. 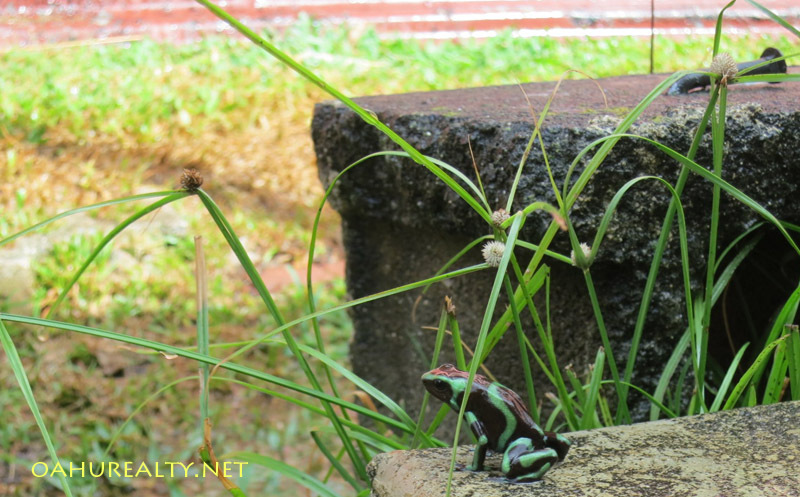 The concrete block behind the frog and the blades of grass may help you get a better perspective of its diminutive size. I have lived in Palolo Valley for nearly 10 years and only took serious notice of the dart frogs in the past couple of years. When I first moved to Palolo I remember seeing small frogs now and then but I didn't pay much attention. Recently I noticed the dart frogs came out after the rains. I tried following them now and then, attempting to get a picture but they'd hop away quickly and hide in the tall grass. Dart frogs are native to South America and Costa Rica. They were imported and released in Manoa Valley in 1932 to control mosquitos. 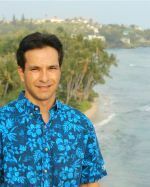 They have also been spotted in Waiahole Valley and Palolo Valley. One can find dart frogs outdoors, as I have found them in my backyard. However dart frogs are invasive species and possessing them is considered a class C felony. Imagine that! They're hopping around my backyard and I'm not supposed to possess them. Somehow I think I'll be okay, the key seems to be transporting and selling "prohibited species". According to the Department of Agriculture website, poison dart frogs have a toxin on their skin. In their native locations, hunters will use the secretions from the frogs skin, applying it to arrowheads. The poison is potent and one frog's skin secretions can be used for possibly 50 arrowheads. We're lucky here in Hawaii. The frogs' diet of ants and small insects is different from that of other places and it makes their skin secretions less poisonous. I'm glad to know that, I wouldn't want my dogs to get poisoned from one of these froggies. They're so small, the dogs tend to ignore them, a good policy for the frogs and for the dogs.